This is a really nice quilt. Love the great quality. I would highly recommend this product. The weight of the quilt is just right. This is our first king size bed, glad we went with this high quality quilt. This has to be my favorite set yet! It's made beautifully and will last forever! The skirt completes it! Lovely cotton set. On the California king. The dementions are 115x130. The cover hangs to the bed rail. No more fighting for covers in the middle of the night. Very nice soft cotton. Colors easy to buy and mix and match. Very happy with my purchase. Classic style that is simple and sophisticated. The colors are a deep Carmel and black. Not a taupe. 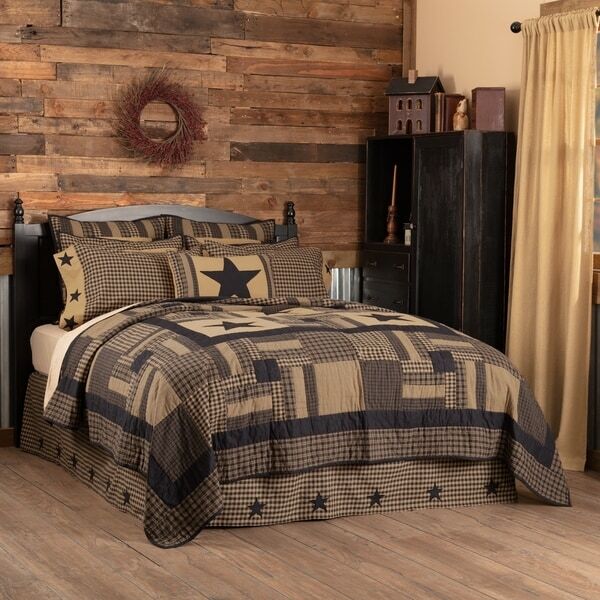 This quilt is so beautiful and looks so great on my daughters bed,the quality of this quilt is topnotch and Overstock offers the best quilts ever,so thank you overstock and keep them coming as we really do love this one. I live in an actual farmhouse so naturally I want my decor to match. This set is for my guest room which is a nice light beige. I got the whole matching set. It is a sturdy set, a bit light which is being fixed by a nice throw at the end of the bed. The colors are darker than they appear, more or a brown and black and not a taupe. It goes right along with the look of my home. It even has a shower curtain to match, which of course I got. I would absolutely recommend this to anyone that wants an antique country look. Absolutely beautiful quilt. Looks wonderful on my new king-sized bed. Looks very durable and well-made. I would recommend this to anyone interested in purchasing a good quality quilt. I love the pattern and material! It's a beautiful quilt and very comfortable!! I would definitely recommend this!! Beautiful! The black stars stand out beautifully giving the room a nice contrast. Comfortable and true to size. Adds an element of elegance to the room. I love it! The quilt I purchased is awesome, its well made, has a lot of detail and its sized so you have extra room on both sides of the overhang. It matches my bedroom style and can be used in various combinations since it is reversible. I am well pleased and would not hesitate to recommend this to my friends. Love it! Bedroom looks great with coordinating set! I absolutely love this pattern and cannot wait to put it all together. We are in the process of changing colors/ ship lapping a wall, & I cannot wait to have it finished so I can see the end result! Nice quality and fast shipping. I love this entire set! Colors are beautiful, quality is better than I expected! High quality for a fair price. I definitely recommend this item; I love the look and the softness of it. "Where can I find matching curtains for this quilt?" Unfortunately matching curtains are not available. The style & design & price. "Does the dust ruffle come with it?"